Chicago has overtaken the Cardinals ... though not in baseball. The city has wrenched the Guinness World Record for "most people wearing Groucho Marx glasses" from an event held by a St. Louis Cardinals minor-league affiliate in Springfield, Mo. 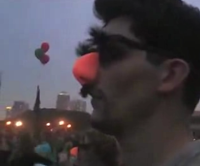 The sparkling new record of 4,436--now verified by Guinness--was attained July 21 during a screening of the classic Marx Brothers movie "Duck Soup" at the Chicago Outdoor Film Festival in Grant Park, the Mayor's Office of Special Events said Tuesday. The previous record of 4,077 was set in 2007.